What Network Am I Connected To? Which Anti-Virus Do I Have? Student webmail is your university provided email address that all university correspondence will be directed to. You will have access to your student webmail for the duration of your studies. It is important to check your emails regularly as anything sent to you will be assumed as seen – including things like assignment due date changes! 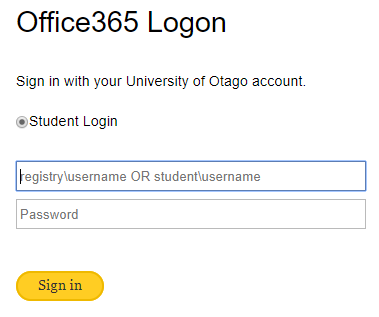 Student webmail can be access via this link www.otago.ac.nz/studentmail. Enter your student username in the top box. E.g. bonja007. If you don’t know your username it can be found on your ID Card. Click here for more info. Password is the same password as your eVision login. If keeping track of another email account is too much, you can set your student emails up to be forwarded to your personal emails, or setup your email account on your phone/computer. Type in the email address you wish to forward your emails to. Tick the checkbox if you wish to keep a copy of each email in you student webmail account. Finally clickÃ�Â save and your emails are now being forwarded. It's very important that if you forward your email you must whitelist it on your email provider. If you'd rather have access to your email account and not forward it, you can use the Microsoft Outlook computer application or mobile phone Outlook application. See here how to setup your StudentMail on your own device. Hours outside semester are reduced to office hours.